This is pretty much what we found ourselves replying upon returning home from our epic fuel haul trips, at a somewhat loss of words. 23 drums of fuel. 1000 km over bumpy snow drifted tundra. Nights spent at cabins in Wapusk National park. All in the name of providing researchers with the support they need to complete their fieldwork. In this case: caching jet fuel for helicopters, allowing polar bear researchers to pit stop and refuel at select locations in the park while investigating the status of the Western Hudson Bay polar bear population. Not that we didn’t enjoy it, experience wonderful expanses of nature, or have stories to tell. But driving a snowmachine for entire days, dawn till dusk, leaves you alone in your own mind for the majority of the day. Sure, the physical demands of maneuvering a machine, dealing with broken hitches, stalled machines, and snapped ratchet straps can be challenging. 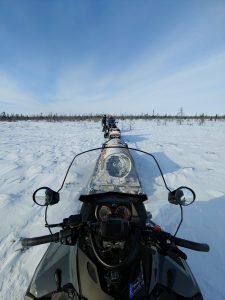 But the mental game of occupying your mind while barreling along wide open sub-arctic tundra proved to be the real battle. We came quickly to think of it as the Zen of Fuel Hauling. “Where was your mind the past hour and a half?” We would ask each other at some of our breaks, snacking on trail mix and stretching our arms to the sky. We would laugh, jump back on our snowmachines, give eachother a thumbs up, and not speak again for a few hours. Passing wolf tracks, a solitary snowy owl sweeping across ground, reflecting on how much tundra resembles a desert, orange sand replaced with white snow. 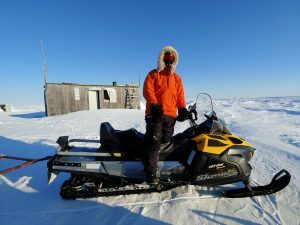 Springtime is an important season for polar bear researchers to conduct their work, traveling by helicopter in the vast area around Churchill and throughout Wapusk National Park. The name Wapusk coming from the Cree word for polar bear, Wapusk National Park gained park status in 1996 being recognized as a very important area for denning polar bears. Home to a portion of the western Hudson Bay polar bear population, denning mothers emerge with their newly born cubs in the spring from dens dug into the peat. 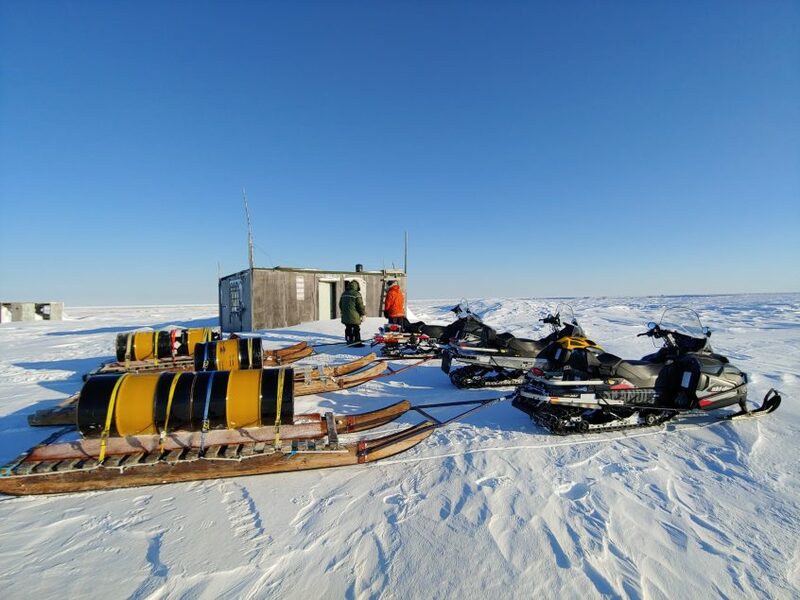 Long term monitoring of polar bears here continues to provide valuable information on the future of this vulnerable species, and the Churchill Northern Studies Centre functions as a base for conducting this research. 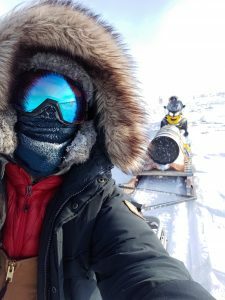 Our role in providing assistance through fuel caching is one of the many ways the CNSC facilitates research in the Churchill area.